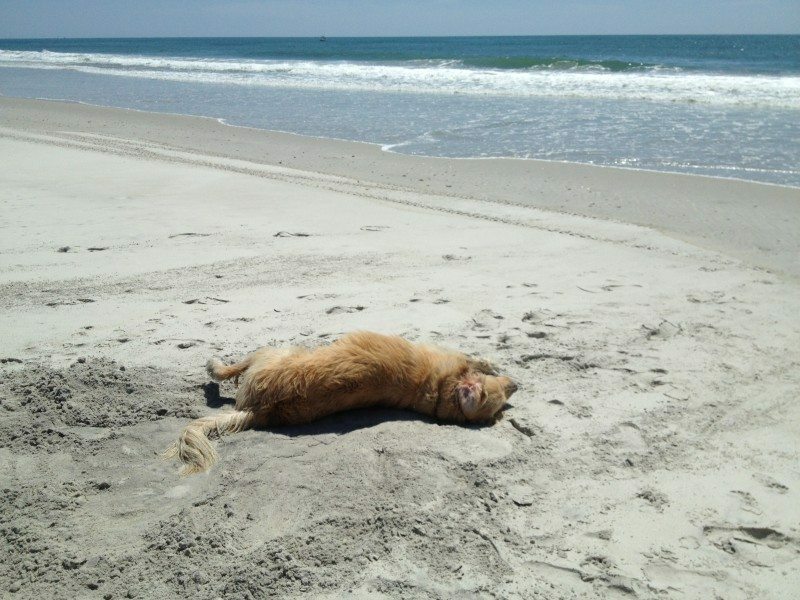 This post on understanding your dog’s instincts is sponsored by Purina. All the opinions expressed are 100% my own. Have you ever wondered why your dog rolls in something smelly, licks your face, circles before lying down or immediately has a smell off with a new dog? These behaviors are all a part of your dog’s natural instinct, something that Purina ONE Dog has set out to educate pet owners on so they can better understand their favorite companions. Choosing dog food seems like an easy task right? Well it is as important as picking out food for your family. Chloe’s breeder suggested a Purina product when she was a puppy. We have stuck with this brand, just changing the variety when she moved out of puppyhood. 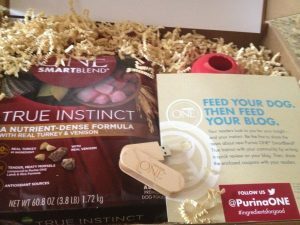 I was recently asked to review another Purina Product, Purina One SmartBlend True Instinct. Dogs can be pretty active animals, especially at a young age and they need nutrient dense foods. 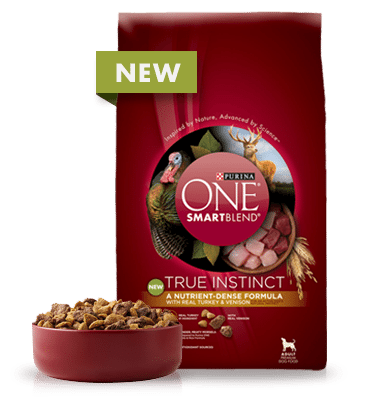 Purina One SmartBlend True Instinct provides 30% protein that will provide the nutrition and energy your dog needs. You don’t think of your dog as a carnivore but they need the extra protein to stay healthy. Be sure when choosing a dog food that the first ingredient is a protein, and hopefully an all natural one. Be sure to check all the ingredients yourself and do your own research. I am not an expert on this! For exact ingredients check out Purina’s Website. Purina One SmartBlend has Real Turkey as its #1 ingredient as well as. It has Natural sources of Glucosamine, to help support healthy joints. Very important in larger breed dogs. Omega-6 Fatty acids provide your pup with a radiant coat and healthy skin. NO artificial flavors or preservatives either, Don’t you watch for these ingredients in your family’s food too? MADE IN THE USA. I have been a big advocate for dog products made in the USA. Chloe is not a picky eater so to say that she liked this food would not carry too much weight. I know she is getting a quality diet from the Purina ONe brand and giving her a little variety in her diet. When switching dog foods, be sure and do so gradually by adding only a small amount to the food you are weaning off. This will help your dog avoid too many gastrointestinal issues. My dog Ashantia howels when I get up in the morning. My dog Cheyenne knows she can’t just walk up and take a bone from her “brother”, so she gets sneaky about it instead. She will suddenly get up and run to the back door as if she heard someone knock or come in. When Shiloh runs to check it out as well, she circles around and lays down on his bone. She also lays on his toys when she gets sick of him squeaking them, lol. My chihuahua dances for treats. My MaggieMae runs around our living room bouncing off the recliner fronts of our loveseat and recliners. She reminds of a pinball game when she does this! My dod has OCD…she spins around in a certain pattern before she lays down! Well, her latest funny behaviour is that she won’t eat out of her bowl. It has to be off a dinner plate, and iit can’t be a paper plate either. Has to be a regular china/pottery/glass dinner plate. And since her Springer brother died almost 2 yrs ago, she won’t eat kibble, she will only eat meat, cheese, vanilla yougurt [sometimes] and eggs. Since she’s 11 and pretty healthy, I don’t fuss about it too much anymore, just give her what she’ll eat. This is for my sister’s new rescue, a golden mix, or my local shelter. Thanks for the giveaway. My dog, Ella, jumps up and does a 360 twist with excitement before getting a treat. My dog Kota loves his squeaky toy. He sqeaks and flips it and then cries like a baby. He loves watching tv and he sings with music. When I give my puppy a dog biscuit, she will play with it and toss it around several times before she eats it. My dog’s funny behavior is that she moves her mouth like she’s talking to us. My dog’s funny move is that she is better at catching mice than the cat!